The Cryogenian (pronounced /kraɪoʊˈdʒɛniən/, from Greek cryos "cold" and genesis "birth") is a geologic period that lasted from 720 to 635 million years ago. It forms the second geologic period of the Neoproterozoic Era, preceded by the Tonian Period and followed by the Ediacaran. The Sturtian and Marinoan glaciations, which are the greatest ice ages known to have occurred on Earth, occurred during this period. These events are the subject of much scientific controversy. The main debate contests whether these glaciations covered the entire planet (the so-called 'Snowball Earth') or if a band of open sea survived near the equator (termed 'slushball Earth'). 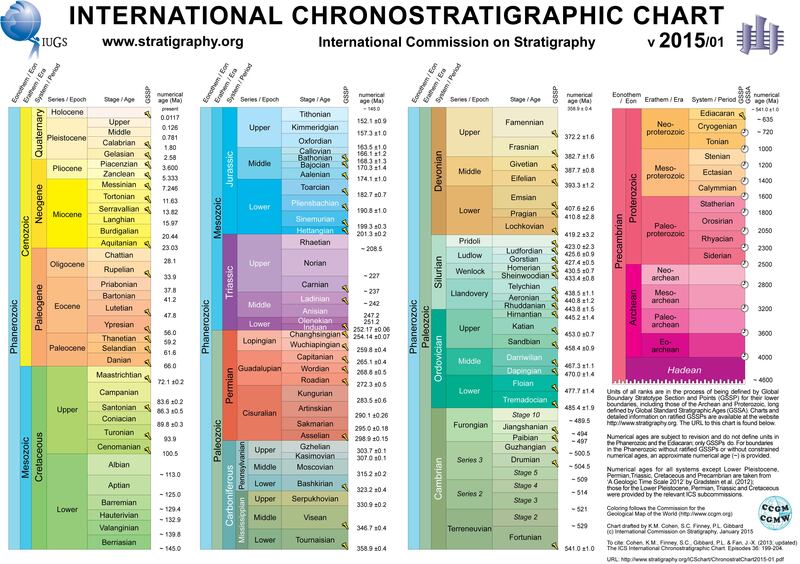 The Cryogenian period was ratified in 1990 by the International Commission on Stratigraphy. In contrast to most other time periods, the beginning of the Cryogenian is not linked to a globally observable and documented event. Instead the base of the period is defined by a fixed rock age, that was set at 850 million years until 2015, when it was changed to 720 million years. This is problematic as estimates of rock ages are variable and are subject to laboratory error. For instance, the time scale of the Cambrian Period is not reckoned by rock younger than a given age (541 million years), but by the appearance of the worldwide Treptichnus pedum diagnostic trace fossil assemblages. This means that rocks can be recognized as Cambrian when examined in the field and do not require extensive testing to be performed in a lab to find a date. Currently, there is no consensus on what global event is a suitable candidate to mark the start of the Cryogenian Period, but a global glaciation would be a likely candidate. The name of the geologic period refers to the very cold global climate of the Cryogenian: characteristic glacial deposits indicate that Earth suffered the most severe ice ages in its history during this period (Sturtian and Marinoan). Glaciers extended and contracted in a series of rhythmic pulses, possibly reaching as far as the equator. The Cryogenian is generally considered to be divisible into at least two major worldwide glaciations. The Sturtian glaciation persisted from 750 to 700 million years ago, and the Marinoan glaciation which ended approximately 635 M.Y.A., at the end of the Cryogenian. The deposits of glacial tillite also occur in places that were at low latitudes during the Cryogenian, a phenomenon which led to the hypothesis of deeply frozen planetary oceans called "Snowball Earth". Before the start of the Cryogenian, around 750 Mya, the cratons that made up the supercontinent Rodinia started to rift apart. The superocean Mirovia began to close while the superocean Panthalassa began to form. The cratons (possibly) later assembled into another supercontinent called Pannotia, in the Ediacaran. Fossils of testate amoeba (or Arcellinida) first appear during the Cryogenian period. During the Cryogenian period, the oldest known fossils of sponges (and therefore animals) make an appearance. The issue of whether or not biology was impacted by this event has not been settled, for example Porter (2000) suggests that new groups of life evolved during this period, including the red algae and green algae, stramenopiles, ciliates, dinoflagellates, and testate amoeba. The Time Travellers Guide To Australia (Australia, 2012). ↑ These events were formerly considered together as the Varanger glaciations, from their first detection in Norway's Varanger Peninsula. This page was last modified on 30 December 2015, at 16:02.